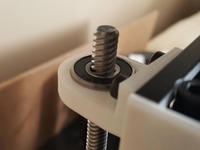 Anti backlash nut adapter for the Ender 3 by registeredthing is licensed under the Creative Commons - Attribution license. This is an anti-backlash nut adapter for the Ender 3. 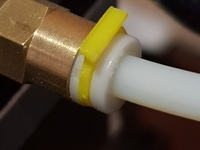 This part adapts the mounting holes on the Ender 3 to a cheap two piece brass anti-backlash nut with a round flange with holes for mounting. The anti-backlash nuts can be found on Ebay by searching for "T8 8mm Anti-backlash Spring Loaded Nut Screw" or you can get them on Amazon as well. They should cost between $2-7. This part uses four to six M3 locknuts (depending on how many holes you want to use), and you will need to determine the screw sizes needed. 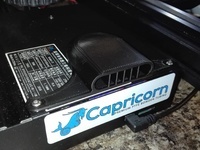 I used a couple of m3x16mm (anti-backlash nut side) and m3x12mm (printer side) screws since that's what I had. The total height of the adapter is 11.1mm so please factor that as well. Some washers may be needed if the screws are too long since this design requires the screws to be fully enclosed. It has been pointed out (thanks Pastera), that I mounted this upside down (LOL). At least for the most optimal function of the anti-backlash nut. With it facing up, the top follower is able to press against the bottom of the screw threads, while the bottom follower/mount is pressing on the top of the screw threads (due to gravity). Why did I mount it upside down? I thought that if I mounted it the other way (facing up) it would have required losing about 10-13mm of the z-height, so It was mounted facing down. Swapping it did however fix the issues I was having with the adjustment of the stock brass z-nut. 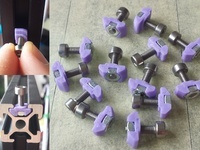 It may be better to drill some holes and mount the nut directly to the carriage without this adapter, if you want to mount an anti-backlash nut for optimal function. Say thanks by giving registeredthing a tip and help them continue to share amazing Things with the Thingiverse community. Say thanks and help registeredthing continue to share amazing Things with the Thingiverse community. You'll need a PayPal account to tip registeredthing. Click the button below and you will be redirected to PayPal. Once the payment is complete, you'll be brought back to Thingiverse.